//Life Ver.15: Update for the past week? Update for the past week? I have only done so much to update my nearly dead blog. I'm too busy doing other things such as online gaming, online window browsing, online nose-picking, spending my money and learning C++ programming language. Instead of waiting a bit more to buy a Razer gaming mouse I blew off my money on a pair of Philips headphones and CyberClean, a sort of gel that absorbs dirt and kills germs. Example: My keyboard is full of biscuit crumbs, dead ants that I accidentally squished while in an intense gaming session, and dust. 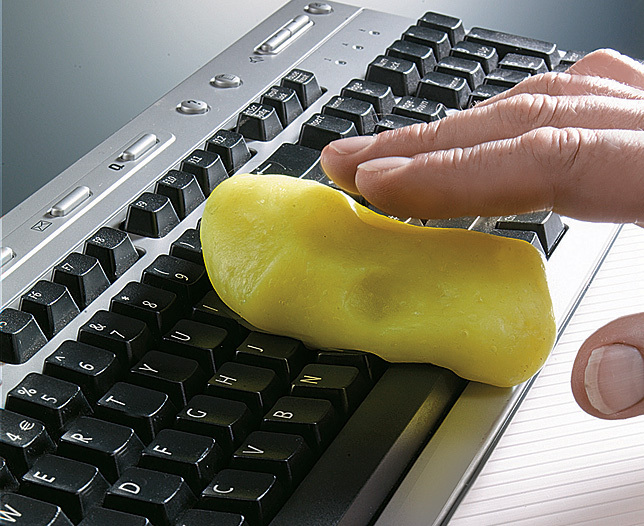 I slap the CyberClean gel between the keys and voila! All the crap are gone! CyberClean is on sale now at ThinkGeek, the world's leading geek item online store. I now use my CyberClean on my phone, my PSP, my camera, almost anywhere my CyberClean slime ball can fit. It reminds me of the Thinking Putty. I came across this wonderful cleaning substance when I read an article in The Star reviewing this. Then I went on ThinkGeek and it was on sale there too. Feeling beat, I went to All IT Hypermart and saw it for sale for about RM19.90.. what to do, just buy lah! Grabbed a pair of headphones I needed too.